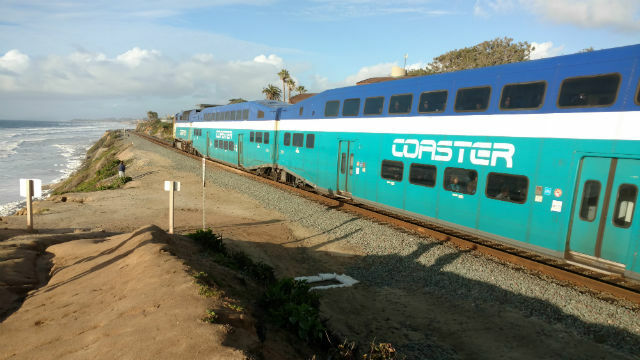 North County Transit District announced Thursday it has fully implemented an ambitious train control system on nearly 60 miles of coastal track. The agency is one of only four across the country that completed “positive train control” by the federally mandated Dec. 31 deadline. The system alerts engineers when unsafe conditions exist, and automatically stops the train when conditions warrant. It’s designed to prevent train collisions, derailments caused by excessive train speed, train movements through misaligned track switches, and unauthorized train entry into work zones. The system controls not only the NCTD’s Coaster commuter trains, but Metrolink, Amtrak and freight trains operated by BNSF and Pacific Sun Railroad. “To finally be able to say that this system is fully implemented is so rewarding. The enhanced safety that it brings to our customers and train crews is unmatched,” said Rebecca Jones, chair of NCTD’s board. “And I’m especially pleased to be able to say it was done by the deadline without the need for an extension,” she added. NCTD provides over 10 million passenger trips annually throughout North San Diego County and into downtown San Diego.